Apple’s new edition AirPods use a brand-new H1 chip, what do we know about it? Apple’s new edition AirPods carry a brand-new piece of proprietary silicon the company calls the H1 (Headphone) chip. What do we know about it? While the new AirPods look exactly like the previous models – little white spikes that dangle out your ears -- they bring useful enhancements: 50 percent more talk time, support for hands-free Siri, faster device syncs, better sounding music playback, power management improvements – and just about all of these improvements depend on Apple’s new H1 chip. What about the W-series chip? The W1 processor used in the last generation of AirPods handling wireless connectivity. The H1 chip adds a range of other abilities focused on use in headphones. That’s a big hint that the company plans to diversify its headset line-up, for example with the introduction of over ear headphones. It’s also common sense, given the company also manufacturers the popular Beats range of headphones – and may hint at other products containing wireless audio playback in future. The Apple Watch continues to use a W-series chip. What other silicon does Apple make? Apple’s silicon development team is developing a rapidly growing range of processors all across the company’s product ecosystem: The A-series speedy mobile processors, the T2 chip inside Macs, the W-series chip, the S-series storage processors, Face ID chips, neural engines, health sensors, eSIM, graphics processors – even the incredible audio chip inside HomePods was developed by Apple. The company continues to invest in processor development, particularly (though not exclusively) around Augmented Reality and machine learning -- in each case it strives to create advantages in processor development competitors cannot match. What does Apple say about the H1 chip? 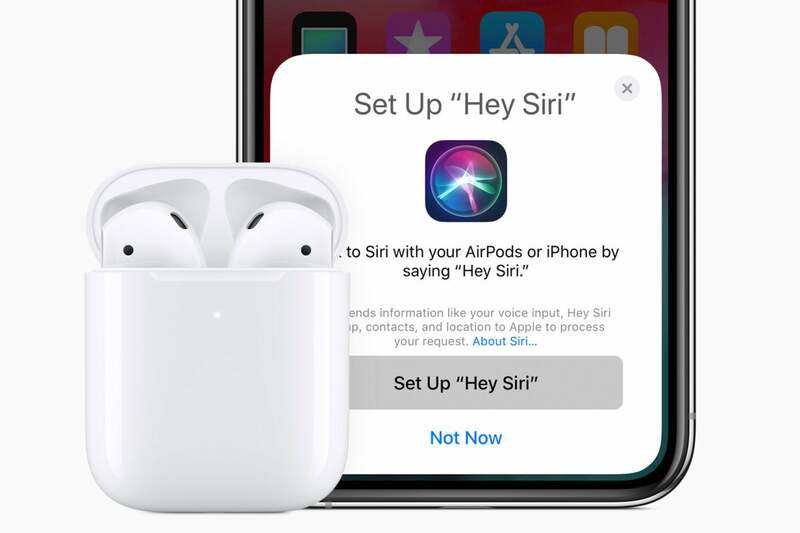 “The new Apple-designed H1 chip, developed specifically for headphones, delivers performance efficiencies, faster connect times, more talk time and the convenience of hands-free "Hey Siri,” it said. What does the H1 do better? The H1 supports better synchronization. In real terms, this means that when you pick up a call using AirPods you’ll connect to the call faster. It also means sync is faster when you switch between different Apple devices as audio source – such as when switching from an iPhone to an Apple Watch when jogging. Apple says the new AirPods sync up to 2x faster when switching between active devices and provide 1.5x faster connection time for phone calls. Do the H1’s support Bluetooth? The H1 processor supports Bluetooth 5.0. What talk and music playback improvements does it provide? The chip provides up to an hour more talk time (three hours, two in the previous AirPods) and when you choose to take a call the processor will hook you up faster than before. The H1 figures out how many AirPod buds you have in your ears (one, two or none) using information gathered by the optical sensors and motion accelerometers on the earbuds. It then routes the audio appropriately and manages the external noise reduction system when you are on a call. What about using AirPods for games? Some users of the original AirPods noticed a little latency when playing games on AirPods. The H1 reduces such latency by 30 percent, Apple said. Apple has introduced a new wireless charging case for both first and second-generation AirPods. It seems more possible than ever that the company may also plan to soon introduce AirPower, but let’s not hold out breath. How does the H1 chip improve battery life? The H1 chip helps conserve battery life. You get five hours listening or up to three hours of talk time on a single charge, and you’ll get 24-hours total from the charge saved in your charging case. 15-minutes of charging time in the case delivers up to three hours listening and two hours chatting, the company says. The H1’s sync enhancements mean that you can use ‘Hey Siri’ for a range of tasks, such as controlling music playback, making calls, sending messages and getting directions. Where can I find more information about AirPods? At time of writing, Apple hasn’t updated its technical specifications document for AirPods which still refers to the older models. The document is here and presumably will be updated or supplemented to reflect the new devices. I’ll be watching for more information on these things as it emerges and will update this story as and when it becomes available. How much do these things cost? If you want to use the H1 processor you’ll have to purchase a set of new AirPods. They cost $199 including a wireless charging case or $159 without. You can purchase the wireless charging case (which also works with the earlier edition of the AirPod) separately for $79.